I know I just posted a few days ago (Happy 2 Months in case you missed it) but, well, the boys are 9 weeks old. And I promised. So here’s an update from the past week. You can’t really tell from this picture but Mason is definitely smaller than Logan and James! It’s really obvious when we put them side by side. 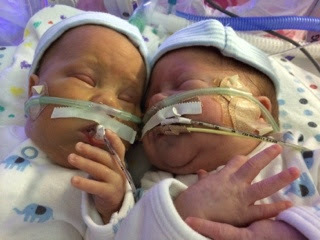 Logan and James are almost too big for preemie clothes! (Is it bad that I’m a little sad about this?) Mason was the uncooperative one for the picture. Everyone (myself included) thought James would be the difficult one. There’s always next time! Thanks to Audra (one of our primary nurses who we really love) for letting us get together finally! Unfortunately we can’t put them together all the time! But maybe from time to time we’ll get to do this! Logan and James are right next to each other so they can actually reach without disconnecting from their machines. Mason is across the room so we had to disconnect him then hook him up to Logan’s backup oxygen. Mason has had a great week. He’s in the lead to go home first . . . but don’t tell him. We don’t want to ruin anything! Remember, we make plans (ok the doctors make plans) and the babies do whatever they want. 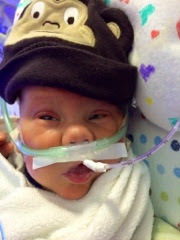 Mason is on a straight oxygen nasal cannula now. That’s the last step before no breathing assistance! But we have to wean him down slowly from here so we’ll have to be patient. (Yeah right!) He’s getting 3 liters (per hour I think?) right now. And he’s doing great! He’s actually having less episodes than he was having on cpap. Yay Mason! Mason has also gotten well enough to stop lots of his meds. His direct bili (liver) is in the normal range now so he stopped taking meds for that. And he finished his last dose methadone today too. Before you judge me (I’m sure you wouldn’t! ), I didn’t cause this. The doctors had to give him lots of morphine to keep him comfortable while his lungs got better. Anyways, basically he’s just getting milk and vitamins at this point. 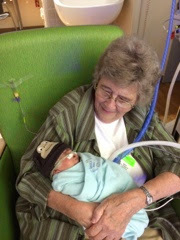 Mason is doing great with the oral stimulation therapy too. 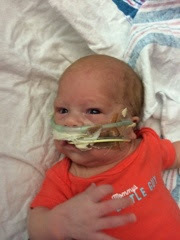 Once he gets down to 1 liter on his oxygen he can start working on eating by mouth. Yay! I can’t wait! Here’s a few pictures of Mason from this week. He has fuzzy hair! Isn’t he the cutest?! He’s very curious and he loves to look around. He’s definitely the most alert of the 3 boys at this point. And usually the calmest. Mr. Logan had the most amazing week. First he got off the jet ventilator. Then he did so well that they extubated him on Saturday! The first time anyone mentioned that he was even close was last Thursday. And even then I thought it would be at least a week. But Logan had different plans! 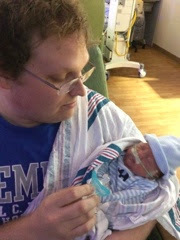 He’s doing great so far on nippv (not sure what it stands for but he gets oxygen, a rate (a certain number if breaths per minute), and pressures). They’ve been able to wean the settings every day so far and his blood gas results have been really good! The next step is cpap (just oxygen and pressures). I guess he was just ready! I’m so glad! Logan also got to start wearing clothes this week and he moved to a big boy bed (a bassinet). He seems to like it. Hopefully he can get his PICC line out tomorrow and then he can start wearing pants! 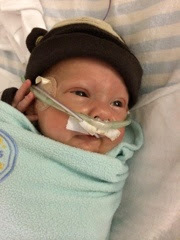 Logan also got to start eating again this week (he was off feeds for a week because of the possible belly infection). He’s tolerated feeds really well and is almost on full feeds again now. Yay! Logan hasn’t started any therapy yet but he loves his paci. Hopefully that’s a good sign. Logan has had one issue this week. He’s going through withdrawal from the morphine! He was on a really high dose of morphine and versed on a drip and he could get morphine and ativan as needed before and he’s getting absolutely nothing now. He’s getting methadone to help but he’s still a little upset. He’s getting much better though. Dr. Miquel added this to his list of diagnoses. But she made sure to include that they caused it not me! I had the sweetest moment with Logan the other day. He was really upset (probably because of the morphine withdrawal) so I picked him up to calm him down. I stood by his bed and rocked him side to side and he calmed down. I think I stood there for over an hour just rocking him back and forth. I have gotten to “help” a lot over the last 9 weeks but this was probably the first time I felt like I was able to take care of one of them like a mommy. I hate that it was because he was feeling bad but I loved that moment! 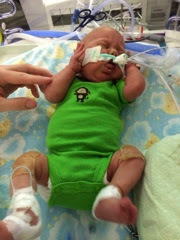 Logan’s first outfit (no pants because of the PICC line in his foot). He’s very puffy in this picture if you look at his face. I think he looks a lot like Mason! My aunt says he looks like me. We’ll see I guess. This one is from today. He is way smaller than in the first picture. 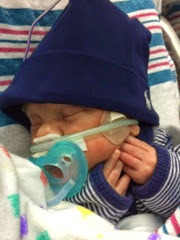 And so sweet with his paci! 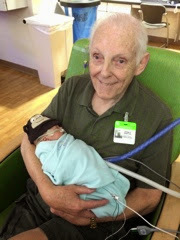 And he finally got to wear his polo hat from Sheila (one if his night time primary nurses). He’s lost a lot of fluid since the first picture! He’s way smaller now! James is doing much better this week. He’s getting erythromycin to help with his digestion and it’s really helping his reflux. He’s still getting his feeds into his intestines but I can tell he’s much happier. When I hold him he seems content and he’s not squirmy like he was before. 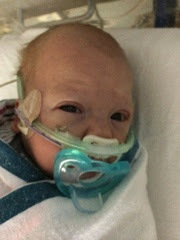 James is on cpap again on pretty low settings. 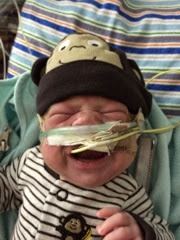 But he probably won’t be ready for the straight oxygen nasal cannula too soon. He’s still having quite a few episodes and his oxygen requirement isn’t quite low enough. But he’ll get there. This one really captures James’s attitude! And we had some visitors this week too! First my Grandma and Grandpa came to visit. They got to hold Mason and James for the first time! 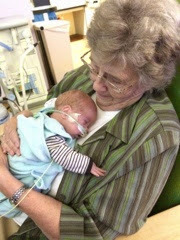 Grandma with James. He looks pretty happy! Then my parents and my brother (one of the 3 – all born a different times) came to visit. 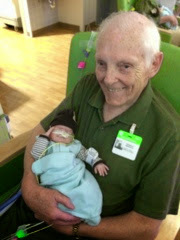 So uncle Joey got to hold Mason for the first time! He’s a natural. But we already knew that! 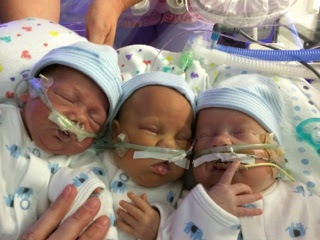 This entry was posted in #goals, Family, NICU, Triplet Milestones by Angela Mann. Bookmark the permalink.